After losing her father before she was born, her mother at age 10, and surviving a series of failed relationships, Tulsa Riley is not a risk-taker in any of her personal relationships. Slow to trust and a hard worker in the river running outfit she runs with the grandmother who took her in after her mother’s death, she’s eminently pragmatic. Grandma Ruby wants more for her granddaughter than just being a business partner. In hopes that susceptibility to love might be contagious, she coaxes Tulsa to join her and three friends in a romance readers’ book club. Tulsa reluctantly agrees, but is distracted by the demands of running a business along the Sweet Oak River that skates the bare edge of profitability. When a crafty neighbor who lusts after their land starts trying to squeeze them out of the neighborhood, Tulsa barely has time for work, much less books and fending off the attentions of a rich, handsome client. 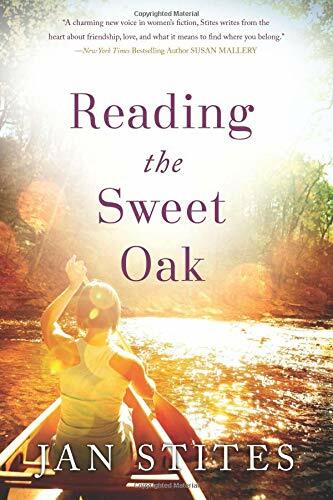 Reading the Sweet Oak, Jan Stites’ debut novel, is a sweet romance, akin to the novels its heroines devour in their book club. Though Tulsa and Ruby are the focal characters in the story, the other member of their book club face their own problems, each particularly suited to one of the books Ruby has assigned them to read, and each find themselves encouraged to move forward in their romantic lives. Stites has a sympathetic touch for each of her characters and takes each of their problems seriously. Through this book club, the reader is taken through frigidity and fear with BJ, the travails of an alcoholic parent and a commitment shy boyfriend with Jen, and a journey to acceptance of differences between people with Pearl. The solutions to each woman’s problems are neither easy nor easily won. They are all strong characters, a plus in women’s fiction. Tulsa’s and Ruby’s stories are the centerpiece of this novel. Ruby is the one character that has never missed love in her life—she got married at 15 to a man that she deeply loved and still misses years after his death. Her life is now devoted to the happiness of her granddaughter, which includes trying to get her own health issues under control and keeping hold of her land. This subplot is the most fun, as Ruby and Tulsa (along with their handyman Guy) try to outthink a cartoonishly evil, land-grabbing neighbor. His reach in the small Missouri town is worthy of Mr. Potter in It’s A Wonderful Life (and about as believable); the exchanges between him and the central characters are lovely. Less lovely are Guy’s story (an offshoot of BJ’s story) and Tulsa’s romance with a handsome stranger. Though both Guy and Slade (the Handsome Stranger) are both likable characters, worthy of the standard “too charming and handsome to believe” romance novel treatment, their stories are told in an almost perfunctory fashion. What is nice is that the other “good guy” characters break that too-handsome mold and are described as being beautifully average. That doesn’t happen often in modern romance, and it’s a welcome difference. In contrast, Stites does a lovely job of describing the Sweet Oak River. The setting is almost its own character, weaving in and around all of the stories. Tulsa’s reluctance to leave its cool, green lushness for the big city is central to this story, and entirely understandable when Stites’ writing is so very evocative. Reading the Sweet Oak is a book that seems to have been taken from another, gentler decade of romance. Not overly sexual, it’s romantic and well . . . sweet. With bright characters and that beautiful setting, who wouldn’t want to settle down with a hot toddy and imagine drifting down the river with Tulsa?